Alabama state policy allows students to earn dual credit for academic and/or CTE courses taken at their high school, postsecondary institution, or online. Public postsecondary institutions, however, are not required to accept these credits (Education Commission of the States, 2015). Alabama is not participating in the Early College High School Initiative (ECHSI). More information about schools participating in ECHSI is available at the ECHSI website (Jobs for the Future, n.d.). Alabama organizes its CTE programs using the Career Clusters framework. Alabama also implements programs of study across all 16 Career Clusters. 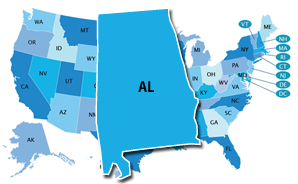 Alabama does not have a statewide system for career exploration or career plans at the K–12 level. Alabama’s state-specific Early Warning System is called the Graduation Tracking System (GTS). The level at which Early Warning System data are reported is not publicly available. District administrators are allowed to access Early Warning System data; however, it is unclear if others can access the data.